The Medical University of Vienna (MUW) is the largest medical research institution in Austria. 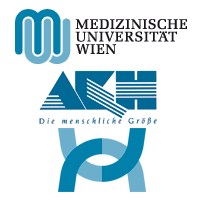 It was founded in 1365 as a Medical Faculty of the University of Vienna and became an autonomous university in 2004. The MUW consists of 31 clinical departments and 12 medical-theoretical departments. The MUW is experienced with the framework of FP7-projects participating in more than 85 FP7 projects. The university offers an excellent research and administrative infrastucture (IT, controlling, HR-support, access to journals, etc) to conduct such research projects. The Department of Paediatrics and Adolescents is large tertiary care university hospital providing all paediatric subspecialities. It consists of 5 clinical research divisions, 4 basic resarch units, and a medical education unit. It has extensive experience in clinical research, including academic and industry-sponsored multicenter drug trials in children where the methodological challenge of small population groups is almost universally encountered. There is close cooperation with the Department of Clinical Pharmacology at the MUW on several projects in paediatric clinical pharmacology; and there is close cooperation with the CeMSIIS. The Department of Paediatrics has been engaged in building an Austrian paediatric research network for drug studies (O.K.ids) that will be operative from April 2013 and which shall become part of the European paediatric network (EnprEMA). Main Project Tasks and Experiences related to the project: The department of paediatrics is fully responsible for the work package “Dissemination” and chairs the Advisory Board. Prof. Christoph Male is associate professor of paediatrics at the Department of Paediatrics, MUW, and deputy chair for research in the Division of Paediatric Cardiology. He holds a MSc degree in ‘Health Research Methodology’ (McMaster University, Hamilton, ON, Canada). His scientific interest is in paediatric haemostasis & thrombosis, drug evaluation and clinical trials methodology in children. Since 2007, he serves as the Austrian delegate in the Paediatric Committee (PDCO) at the European Medicines Evaluation Agency (EMA). He is currently chair of the Extrapolation working group at EMA who recently drafted the Concept paper on extrapolation of efficacy and safety in drug development [CHMP 2007]. C. M. is chair of the working group on medicinal products of the Austrian Paediatric Society, deputy chair of the Austrian paediatric research network for drug trials (O.K.ids), course director of the Master of Science Programmemee in ‘Clinical Research’ at the MUW, member of the ethics committee at the MUW, Co-Chair of the Paediatric Subcommittee of the International Society of Thrombosis & Haemostasis (ISTH), and Board Member of Society of Thrombosis and Haemostasis Research (GTH).